I grew up in church. By that I don’t mean I went three times a week on average, and every time the doors were open otherwise, but that was true as well. What I mean is it was in church that I grew most. I grew in the way that mattered. I grew in faith. From the time I was old enough to read, I had Sunday School teachers that required me to memorize scriptures, and read my Bible. It was simply expected that we would know God’s word, and if you didn’t, the disappointment showed on their faces. I still have a little white plastic case with scripture cards in it that were given to me when I was around 10 years old. But even though I grew up in church, it took many years before I was willing to show it, to be bold in my faith. All that I’d learned I’d also locked away in my head and my heart. Yes, even in the dark years when I grew up, being a Christian wasn’t popular, and I didn’t like the remarks and jokes made at my expense. I can understand how hard it is sometimes for a Christian to be themselves – the saved and sanctified – to others. But being anything less presents an identity crisis. If you continually pretend to be someone you’re not – or less of whom you are, before long, you’ll be the one you pretend to be. If there’s one thing I have found it’s that people cannot argue with your good works. They may argue with your knowledge of the Bible, they may argue with your religion, they may criticize how you live up to God’s word, but they won’t have a word to say when you’re doing good things for others. The reason is simple – they see the God’s love in you through your good works. James 2:14-17 talks about doing good works, and how to win souls and influence people. It says “What does it profit, my brethren, if someone says he has faith but does not have works? Can faith save him? If a brother or sister is naked and destitute of daily food, and one of you says to them, “Depart in peace, be warmed and filled,” but you do not give them the things which are needed for the body, what does it profit? Thus also faith by itself, if it does not have works, is dead.” Those that are hungry need your good works giving them food long before they need your religion or your recital of scripture. A hungry stomach speaks much louder than you can! James goes on to say that if you don’t do good works toward those that are in need, your faith is dead. Is he saying that you have no faith? Is he saying that your salvation has somehow been nullified? Absolutely not! A body is still a body even if it dies. Faith is still faith even if you don’t feed it, don’t use it, and it lies dormant. But what good is it to you to have seeds in your pocket if you’re a farmer? What harvest are you going to have if you won’t put your seeds in the ground? James goes on in verses 18-20 saying “But someone will say, “You have faith, and I have works.” Show me your faith without your works, and I will show you my faith BY my works. You believe that there is one God. You do well. Even the demons believe—and tremble! But do you want to know, O foolish man, that faith without works is dead?” He says he will show his faith BY his works, because believing in God is not enough. Believing in God and having nothing good come from it puts you on the same level as the demons, which at least tremble in knowing Him. Faith is best seen by showing its fruit – which is love. Showing the love within you given by the Holy Spirit shows your belief in God and your allegiance to Him. It’s not enough to just tell others “I’m a born again Christian”, which is just religious rhetoric to those that don’t understand the term. But show them the love that’s in your heart and you show them who God is. Show them forgiveness, show them compassion, show them respect, and meet their physical needs. 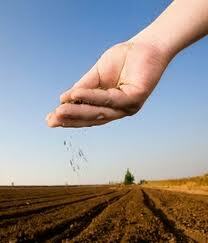 Take the seeds of faith out of your pocket and plant them! The faith within you will grow, and their belief in Him will be the harvest of those good works.